Bonito’s MeteoCom 6 Software processing Weather Data which was transmitted by Shortwave radio (WeatherFax, Synopsis, RTTY, Navtex, CW etc.) and from the Internet (GSM, UMTS, Wi-Fi, or Satellite phone) in one Program. You can access ALL available weather stations. Instead to trust the predictions of the weather service from Hamburg in the Mediterranean only, you can receive the transmissions of other stations such as Ankara, Roma, etc. Northwood to have a different source of information. 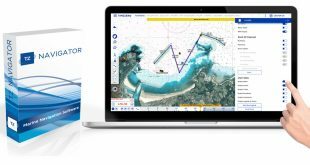 Especially on long sailing trips MeteoCom 6 is a MUST-HAVE-Item on your boat in order to get weather information like Weather forecast, Analysis, Radar images etc. in the middle of the Atlantic or Pacific. That’s one of the reasons why round-the-world yachtsman and approx 2000 commercial vessels using our Bonito products. MeteoCom regulates the reception via shortwave as well as the Internet download and works independently in the background. While you run for example a Navigation Software, MeteoCom 6 still receives automatically the current WeatherFax. 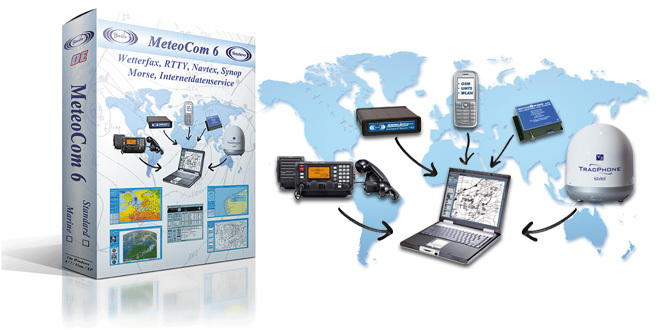 MeteoCom 6 is the evolution of the hugely successful predecessor BordTerminal’98. Two shortwave receivers can be connected simultaneously and a Navtex receiver or a WEATHERiNFOBOX. The program works after creating a personal timer automatically in the background. MeteoCom 6 is split in two parts. The MeteoCom Background Server and the MeteoViewer. The Background Server regulates the reception by shortwave as well as the automatic download via internet. MeteoViewer visualized all receiving weather information from both the shortwave and the internet. In automatic mode, the software is hidden in the taskbar. In the Radio manager are all frequencies, transmission times and parameters as well as the timer included. Here you can also do manual adjustments, checking the quality of the reception or create your own timer. The radio is controlled fully automatically per timer via the integrated frequency list and spoken news (Audio), Weather fax, Morse, Radio teletype can be decoded and recorded. New messages are sorted and old messages erased. Because nobody knows when and what is being transmitted and for which region the actual weather forecast is a ScheduleManger has been integrated this tells you when / where / and for whom is being transmitted. These data can be updated via internet.. Here the weather data is displayed, that was received by Shortwave radio or downloaded from the internet. The display of different parameters can be combined. Noteworthy is the smooth flowing resolution of the data grid points, such as e.g. the distance between the wind arrows to each other. Through the newly developed “zoom slider” you can quickly and smoothly zoom to a selected point. Weather fax is broadcasted worldwide free of charge for decades by many stations and still is the standard worldwide. There are many stations worldwide and the large maps cover huge areas. There are many stations worldwide and the large maps cover huge areas. The weather maps are received and decoded with special decoders and technology and displayed 1:1. Thus, every little detail of the map can be seen. Special filters allow the elimination of interference and even noisy Weatherfaxes are still shown legibly. The received text from the SSB-Radio such as weather reports Navtex reports and so on are pre sorted and placed in the appropriate folder, so that you do not have to search for a particular Atlantic report. Weather forecast texts of the DWD in graphics and animation The popular weather forecast texts (3 or 5 day forecasts) of the DWD are displayed in text format and translated into graphics and animation, too. This makes understanding the weather situation more transparent. Synopsis data are measured values ​​and the foundation of all predictions. These data indicate the values ​​that surrounded you actually and had surrounded you. With this data you are able to verify the forecast data by your self. The synoptic data are translated into clear text and placed in the world weather cards, so that they can be used by the MeteoViewer. The data is displayed as Isobars, Isotherms or as small symbols for wind, temperature, clouds, rain, air pressure and so on. With the “Marine Edition” you can download the synoptic data of the last 7 days, even over the Internet. This is interesting for the use of digital logbooks as TripCon. MeteoCom 6 includes MeteoRouteControl: You can create the planned route on a map similar to a navigation map*. MeteoCom calculates the weather data using the journey’s estimated time and colors the planned route according to the weather situation. Thus you can see easily when, at what time, and on what route section unfavorable weather conditions will be expected. The route can be modified and exported, if necessary. This feature is meant to control a route realistically, using a GPS, from the meteorological site. With a simple click on the “Play” button the sailing trip will be animated as a movie. A weather data overlay on navigation charts is therefore completely unnecessary. *There is no guarantee given by us for the topicality and correctness of the Navigation charts. An additional option is the Internet weather forecast data via the MeteoServer (www.meteoserver.net). It allows downloading high resolution forecast data up to 7 days and even satellite images. The weather forecast data servers are a good and inexpensive addition to the Weather information received by MeteCom 6 via Shortwave. Depending on the different meteorological data downloaded, different data layers can be combined: such as wind, air pressure, waves, etc..
With animation, the weather development can be reviewed during the period of the received forecast data. The MeteoServer provides a large selection of Satellite images from which the WeatherInfoViewer can create animations. With the MeteoCom 6 Standard and the Marine Edition gives you the possibility to connect an optional NAVTEX receiver (eg NX2600). This allows you to receive permanently Navtex messages. Also the connection of the WEATHERiNFOBOX is possible (available here). These devices store received data independently in its own memory. After connecting it to the Computer, MeteoCom 6 is reading out the Memory and display all stored data and the Barograph values. In connection with battery operation, built-in antenna and an integrated barometer, the WEATHERiNFOBOX provides a useful extension for you. The Internet option can be subsequently activated at any time via the Internet or telephone. What features are available for which version? The Standard Version processes all data received via the SSB radio (Weatherfax, RTTY, Synopsis, Warnings, Navtex, Forecast texts, etc.) with modern technology. The data are processed, sorted, classifies and visualizes in that way that even complex weather conditions are presented in easy to understand images or animations. In addition, it converts the receiving forecast text messages from GWS into graphics and animation and draws barograph charts. The received weather information is processed and presented in accordance with modern meteorological, Mesoscale aspects. The standard version gives you the opportunity to receive worldwide weather information free of charge. By free online updates your software is always up to date. In addition to the functions of the standard version, this version can handle weather data from the Internet from MeteoServer. Here we use the latest technology (BMSD instead of the old GRIB) to keep the volume of the data as small as possible. You can quickly and easily download forecast data up to 7 days, synoptic data (important actual values) and even Hi-Res satellite images. The MeteoServer weather forecast data is a recommendable and inexpensive addition to the data received from the SSB radio. With this System you have the opportunity to download for example 5 days forecast data and plan your trip. On the sailing trip you will receive weather information via short wave and MeteoCom 6.